DUCRAY Hidrosisanti perspirant Roll-on responds to the problem of excessive underarm sweating. Thanks to a synergy of assets, its triple action formula allows to absorb mo.. Description: A Sensitive Skin deodorant based on pure natural mineral salts that provides day-long protection without causing irritation. Formulated with Aloe Vera and Grapefruit seed extract i.. Description: A Sensitive Skin deodorant based on pure natural mineral salts that provides day-long protection without causing irritation. Formulated with Aloe Vera and Grapefruit seed extract it l.. Description : • UK's No.1 deodorant brand • Our best ever protection against underarm stains • Feel the confidence to move with MotionSense technology • Stain-minimising fo.. Description : • UK’s No.1 deodorant brand • Clean, energising fragrance for uplifting freshness • MotionSense technology keeps you fresh with every move • Up to 48 hours of protection against.. 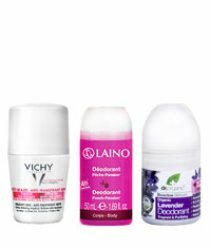 Description : • UK's No.1 deodorant brand • the scent of aloe vera keeps you calm • MotionSense technology keeps you fresh with every move • Stay active with confidence and comfort • Up to .. Description : • UK's No.1 deodorant brand • Cool, quick-drying formula • MotionSense technology keeps you fresh with every move • Stay active with confidence and comfort • Up to 48-ho.. Description: Stick format, free from aluminium salts, perfectly adapted to all skin types, even sensitive. Zinc ricinoleate, a deodorant and antibacterial active ingredient that absorbs odo.. Description: A gentle formula, specially adapted for sensitive and depilated skin. The anti-perspirant active ingredients combined with soothing Proline Cutei give your skin 48-hour anti-pe..
For women looking for a deodorant without aluminum salts, with a maximum level of efficiency without compromising on tolerance. Association of zinc gluconate and minerals of Vichy mineralizing.. Description: LHA ER 195: refines skin texture and proved its efficacy in growing hair retraction. Reflective pearls: For an instant embellishment of your armpits’ skin. Aluminium Chlorohydrate a.. Description: Hyper-effective anti-perspirant, even under stress. Rich in anti-perspirant active ingredients, ultra-absorbent minerals and Perspicalm™, this anti-perspirant regulates heat an.. Description: The formula, rich in anti-perspirant active ingredients and ultra-absorbent minerals, regulates perspiration and moisture for 72 hours. Your skin is comfortable with no stickin..